Two serpents intertwining around a staff topped with wings. This imagery comprises the caduceus, an attribute of Hermes, messenger of the Greek gods. Take away the wings and one snake, and you’ve got the Rod of Asclepius, the symbol for the Greek god of medicine. But who came first, Hermes or Asclepius, and why are their staffs so similar? 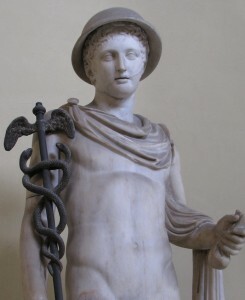 Perhaps Hermes was the precursor, as some myths say that Hermes delivered Asclepius, who after birth, became an apprentice in the art of medicine. Modern medical institutions have adopted both the staff of Hermes and the Rod of Asclepius for their logos, but there is a strong debate on the usage of former, for Hermes also carries the reputation of protecting gamblers and thieves. But we shouldn’t shy away from use of the caduceus. It’s symbolism is much to similar to other formulas. For instance, the two braided snakes resemble that of the double helical structure that makes up DNA. It also corresponds with the structural energies of Kundalini yoga. In Kundalini, there is a powerful Shakti force that lays dormant at the base of the spine, awaiting activation through awareness, practice and meditation. This Kundalini force is depicted as a serpent, reposing in a coiled base three times around the spine. When activated, this force travels through three channels, or nadis; the sushumna, the ida, & the pingala. These nadis are identical to the parts of the caduceus. The sushumna, like the staff, is vertical and straight, traveling in parallel motion with the spine. The ida and pingala channels twist together like that of the two snakes, intersecting at a handful of point, or chakra centers. The sushumna is the stabilizing and grounding core, connecting the base with the crown. Each of the chakras are situated along the column of the sushumna. Kundalini moves upward through this pathway. The Ida and Pingala nadis work together in polarity and duality, just like Yin and Yang. Ida, the left channel, represents feminine and lunar energy as is connected to emotions. Pingala on the other hand is associated with masculine and solar energy as well as mental and physical endeavors. Kundalini energy has the potential to activate when both of these nadis are in balance with each other. Only depicted with the right-sided snake, the Rod of Asclepius is somewhat lacking. Medical advancement definitely focuses around the physical realms, but the healing process cannot be complete without emotional attributes. Is it a coincidence then that the pairing of these two snakes of the caduceus are extremely similar to the channels of Kundalini, a power that has great potential to not only heal, but raise the awareness of our consciousness?